Thoughts from a Traveling Tech: It Was A Mass Murder! It Was A Mass Murder! 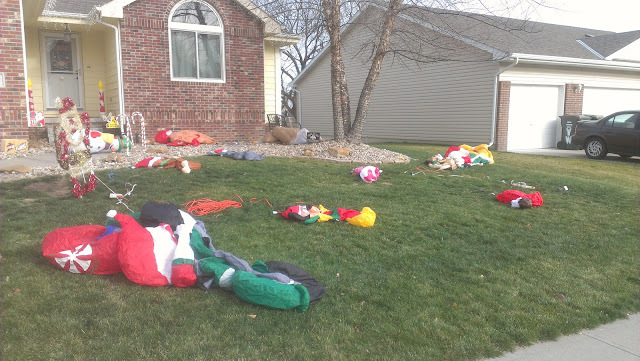 I was driving home from the store a few days and discovered that there had been a mass murder in our neighborhood. It must have happened very recently as the police had not been there and it was not marked as a crime scene. It was really rather gruesome to see, all these bodies laying around in various positions. Although I was surprise that there was no blood anywhere. The movies always make these things look so bloody and terribly messy. Surprisingly the bodies were quite clean of any blood or other marks. Must have been death by strangulation or suffocation. Maybe it was poison gas? Naturally, I took a picture as quickly as I could in case someone moved the bodies before the authorities arrived. Can't have any evidence being tainted can we? Cute. You still have a wonderful imagination! I'm gonna go out on a limb here, using my wonderful deductive skills, and say they died from lack of air. How About A Nice Mug of History?